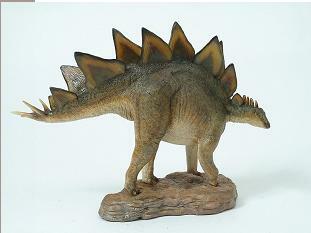 Stegosaurus was up to 26-30 feet long (8-9 m), about 9 feet tall (2.75 m), and weighed about 6,800 pounds (3100 kg). Its small brain was only the size of a walnut (weighing roughly 2.5 - 2.9 ounces (70 - 80 grams). Its skull was long. pointed, and narrow; it had a toothless beak and small cheek teeth. Its head was carried close to the ground, probably no more than 3 feet (1 m) high. Stegosaurus had 17 bony plates that were embedded in its back. The arrangement of these plates was unknown until a 1992 Stegosaurus find in Colorado (Carpenter, et al.) - the plates ran along the Stegosaurus' back and tail in two rows, and the plates alternated in alignment. 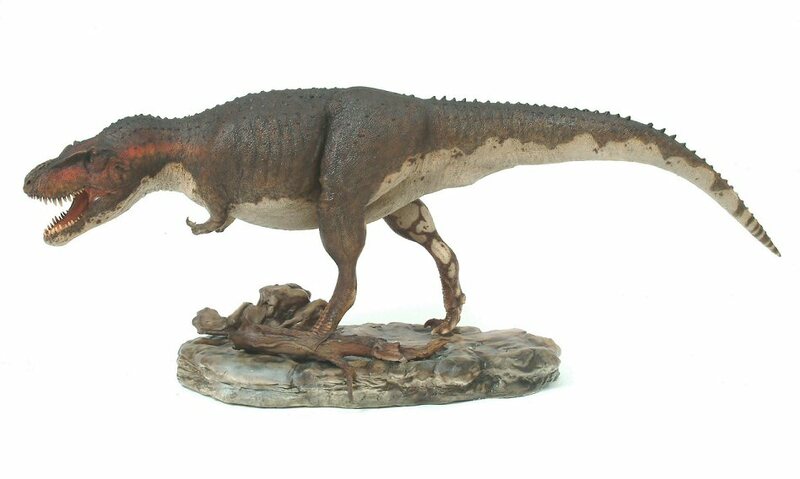 Tyrannosaurus rex was a fierce predator that walked on two powerful legs. This meat-eater had a huge head with large, pointed, replaceable teeth and well-developed jaw muscles. It had tiny arms, each with two fingers. Each bird-like foot had three large toes, all equipped with claws (plus a little dewclaw on a tiny, vestigial fourth toe). T. rex had a slim, stiff, pointed tail that provided balance and allowed quick turns while running. T. rex's neck was short and muscular. Its body was solidly built but its bones were hollow. 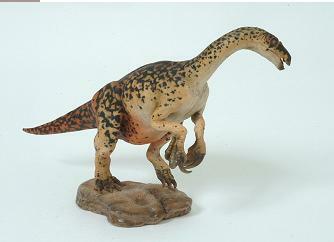 Therizinosaurus cheloniformis ("turtle-formed scythe lizard") was a very large segnosaur (now known as Therizinosaurs). It could grow up to twelve metres (40 feet) long. Therizinosaurus lived in the Late Cretaceous period, around 70 million years ago, and its fossils were first discovered in Mongolia. When it was discovered it was originally thought to be a turtle (hence the name cheloniformis - turtle-formed), but it is now accepted as a maniraptoran dinosaur. Styracosaurus was a four-legged plant-eating dinosaur that had many horns on its head. 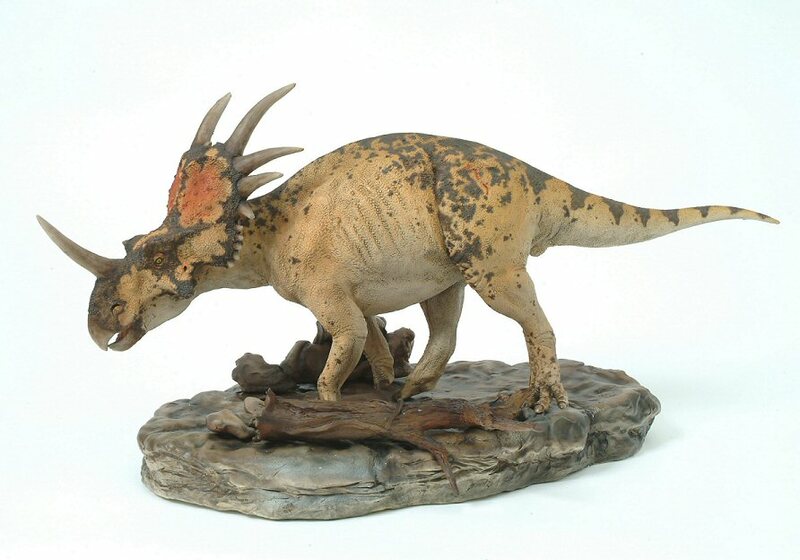 Styracosaurus lived in herds during the late Cretaceous period, about 77-70 million years ago. Anatomy: Styracosaurus had a huge skull with a very large, bony, scalloped, head frill. It had a beak, a long snout horn, two smaller brow horns, and many horns protruding from its frill. Styracosaurus was about 18 feet (5.5 m) long, 6 feet (1.8 m) tall, and weighed up to 3 tons. Diet: Styracosaurus was an herbivore (a plant eater) that ate low-lying plants. Fossils: Styracosaurus was discovered by paleontologist Lawrence M. Lambe in 1913. Fossilized Styracosaurus skulls have been found in Alberta, Canada, and Arizona, USA.